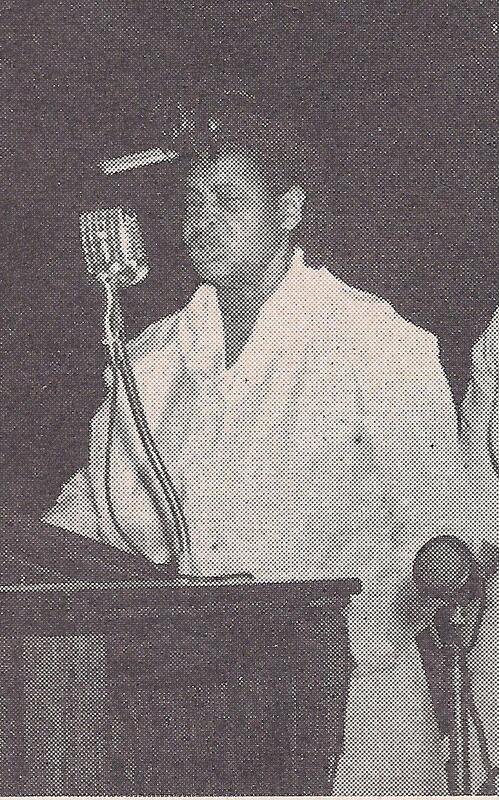 Arizona Dranes spoke at the 1953 Holy Convocation of Church of God In Christ. She was 64 and head of COGIC's handicapped section. New evidence shows that Arizona Dranes, the blind Pentecostal piano player who inspired everyone from Mahalia Jackson to Jerry Lee Lewis, attended the Institute for Deaf, Dumb and Blind Colored Youths in Northwest Austin from 1896- 1912. Let that sink in for a sec: The first person to ever play piano on a gospel record, the musician Sister Rosetta Tharpe credited with influencing her raucous, syncopated style, learned how to play in Austin. Dranes remains virtually unknown today, with only a single blurry photo ever found, but she’s celebrated by prewar gospel and blues enthusiasts. “Arizona Dranes is the most important performer for introducing ‘hot’ piano style to African American gospel music,” says Grammy-winning music historian David Evans. The first musical star of the Church of God in Christ, a Memphis-based Pentecostal sect that pioneered foot-stomping music, Dranes and her lost-in-the-spirit outbursts laid the blueprint for rock ‘n’ roll. The enrollment records disprove previously-accepted biographical information that Dranes was a mere 21 when she invented “the gospel beat” with recordings for Okeh Records in 1926. A minimum age of 7 for the school, puts Dranes’ birth year at 1889, as does the 1900 Federal Census. 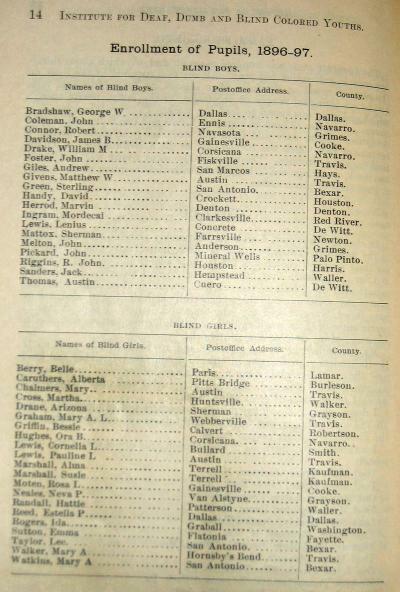 The new information came in early 2007 when Kristi Sprinkle, a Web administrator for the Texas School for the Blind and Visually Impaired, found the official enrollment record for the 1896-1897 school year, which lists “Arizona Drane” of Sherman as a student. Not much is known of Dranes’ whereabouts from her graduation in 1910 until the early 1920s, though at some point she fell in with Hillsboro-raised singing preacher Ford Washington “F.W.” McGee. After becoming a COGIC minister in Oklahoma, McGee presided over a pair of revival tents in Chicago in the mid-1920s. 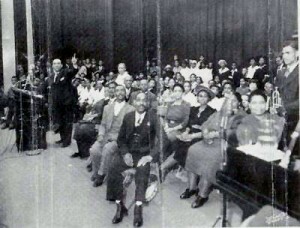 McGee and his Jubilee Singers backed up Dranes on her Nov. 1926 followup session.Then Dranes played piano on McGee’s record “Lion of the Tribe of Judah” the next year. You didn’t need liner notes to know who was thumping those keys. Dranes had been splitting time between Dallas, where she sang for E.M. Page’s COGIC church in the Freedmantown neighborhood (now known as State-Thomas), and Fort Worth, where her divorced parents Cora and Milton lived. Dranes was also a regular at Rev. Samuel Crouch’s Trezevant Hill Church of God In Christ on West Rosedale Avenue. It was Crouch, the great uncle of gospel star Andrae Crouch, who recommended Dranes to a traveling Okeh talent scout in early 1926. At the time, most gospel performances were vocal only or accompanied by guitar, but Dranes stood out with her Holy Ghost-fueled piano. All six sides recorded on June 16, 1926, were released, including a sanctified ragtime instrumental called “Crucifixion,” which has greatly influenced generations of gospel keyboardists. Arizona Dranes was the full package, with a voice that quivered with emotion. She became Okeh’s biggest gospel star almost overnight, but wasn’t always paid in a timely manner, according to correspondence between Dranes and record execs made available in 1970 to writer Malcolm Shaw. “I’ve only received 50 dollars from you,” she wrote Okeh’s owner Elmer Fearn in February, 1928, while stricken with an unspecified illness in Memphis. Her deal called for her to be paid $25 per song. “Of coarse I dident know anything about record making or prices on them and I dident even consult our white friends down here,” reads the letter. “I’m asking that you consider me as I am disable to work now and have to be confined to my room for awhile.” Fearn replie that he had lost track of Dranes (who also lived in Galveston, Oklahoma City and Memphis in the late ’20s) and wired her the $60 she asked for. Arizona Dranes at the piano. Bishop Riley F. Williams at the podium. Atlanta City Auditorium Aug. 1943. By the end of 1928, Dranes’ recording career was over. The Great Depression killed demand for gritty music, But Dranes remained a star on the COGIC circuit, where she often performed before church founder Bishop Charles Mason. Although Dranes established such tunes as “I Shall Wear a Crown,” “My Soul’s a Witness for the Lord” and “Lamb’s Blood Has Washed Me Clean” as COGIC standards, there is no mention of her in the official church biography. The name Arizona Dranes brings only puzzled looks from staffers at the Mason Temple in Memphis, where A.J. Dranes wrecked the house 75 years ago. Dranes died of a stroke on July 27, 1963 at age 74. She had been living at 5219 McKinley Ave. in Los Angeles and attending Crouch Temple, named after her Fort Worth mentor. Dranes’ death certificate, listing her occupation as missionary, says she was buried at the Paradise Memorial Park in Santa Fe Springs, Calif. But no one knows exactly where Dranes’ body is today. Investigators discovered in 1995 that the cemetery had reached capacity 10 years earlier, so the owners were digging up bodies in the older sections and reselling plots. The undertakers would also stack bodies in the same plot, often crushing caskets to fit more in. According to the 1963 burial record, Dranes was laid to rest in section 183, block 4 and lot F-3. According to Warren Clark, a researcher for Find a Grave Inc., that was one of the recycled plots. Dranes’ remains were most likely moved to the mass grave, which was seven feet high and 50 feet wide. Ghastly to think that one of Texas’ most influential gospel musicians would end up in such a discarded state. Blind, sickly and poor, this “holy roller” must’ve seemed quite lost at the big city recording studio. But when she sat at the piano and started thumping out a sinful rhythm while wailing about the glories of salvation, Dranes made musical history; the kind not always written about in books but passed on and modified by a succession of great players. The sanctified Church of God in Christ song leader infused her gospel songs with barrelhouse fire and ragtime flair and unleashed a sharp vocal that quivered like an arrow on impact. The template Dranes created with six tracks in one day came to be called “the gospel beat”; it’s still played against a polyrhythm of hand claps in black church services today. Actually, the music pioneer had died of cerebral arteriosclerosis 30 years before the Document CD was released. According to the death certificate, Dranes was born April 4, 1894, to Cora Jones and a father listed as “Unknown Dranes.” Bios universally have Arizona born in 1905 or 1906 and marvel that she was barely 20 when she made those groundbreaking recordings. She was actually in her mid-’30s when she stepped inside a studio for the first time. Dranes’ recording career was over by 1929, when the Depression dried up demand for down-home Southern gospel, and she confined her playing to Church of God in Christ services. She’s believed to have lived in the early 1930s in Memphis, where the denomination, co-founded in 1897 by Charles H. Mason, is headquartered. She is believed to have later lived in Oklahoma City, where 90-year-old Helen Davis recalls Dranes playing conventions for the church. “She’d play before Bishop Mason spoke,” recalls Davis, a Lott native who now lives in Los Angeles. “She’d get the whole place shouting. She was a blind lady, see, and she’d let the spirit overtake her. She’d jump up from that piano bench when it hit her.” Dranes’ last known public concert was in 1947 in Cleveland. The next year she moved to Los Angeles, where she spent the last 15 years of her life. L.A. was where her mentor, the Rev. Samuel Crouch, had moved from Fort Worth. The great-uncle of singer/pastor Andrae Crouch founded the Emmanuel Church of God in Christ in South Central L.A. in the ’30s. “She wasn’t a member of Emmanuel,” recalls a longtime parishioner, 87-year-old Willie Bell Lewis. “But Sister Dranes would play there whenever she visited. She was a big star in gospel music.” Lewis says she had no idea Dranes had been living in L.A. at the time of her death. Having to rely on faded memories, incomplete county records (especially concerning African Americans) and artifacts that were long ago unloaded at garage sales, musical archaeologists are left with the bones from a magnificent feast of soul and innovation. But the biographical blanks only make Dranes’ music less cluttered with trivial concerns. She remains more spirit than human and when she sings, “He is my story, He is my song,” that’s all you need to know about the singer. Like the best gospel performers, she was an otherworldly vessel fueled by faith; a pet of the force that distributes talent discriminately. They can’t be contained, the voices that are unified, sanctified and possessed by a fiery spirit and so they burst out — reaching for heaven’s gate. 1707 English preacher Isaac Watts publishes ‘Hymns and Spiritual Songs,’ initially met with resistance because hymns were not literal re-creations of David’s Psalms, as was the norm, but infused with personal feelings. 1740s The Great Awakening, first major U.S. evangelical movement, merges African belief systems such as magical rituals with Anglo-Protestant traditions to convert hundreds of thousands, including slaves, to Christianity. 1780s-1930s The Great Revival Movement with its integrated ‘camp meetings’ in rural regions of the country popularizes repetitive choruses and call-and-response techniques. During this ‘Second Great Awakening,’ religion becomes only institutional area in which slaves were allowed freedom of expression. 1889 Arizona Juanita Dranes born in Texas. 1906 The ‘hard gospel’ style is solidified at Azusa Street Revival in Los Angeles, where churchgoers were urged to speak in tongues and lose control when the Holy Ghost was received. Led by black preacher William J. Seymour, the foot-stomping, sanctified, hand-clapping, tambourine-crashing, hallelujah-wailing event ushers in Pentecostal movement. 1907 Azusa Street participant Charles Mason, in a disagreement over the speaking in tongues baptism, breaks with his Church of God in Christ co-founder Charles Jones. The Mason-led COGIC would grow into largest black Pentecostal church in the United States. Arizona Dranes would be church’s first singing star, soon followed by Marlin’s Blind Willie Johnson, Sister Rosetta Tharpe and Ernestine Washington. 1926 Dranes records six original compositions on June 17, including the influential instrumental ‘Crucifixion.’ It is the first time a female piano-playing gospel singer is recorded.